theWTFactory is excited to introduce Sirena Alise as the first Face of SlimClip. 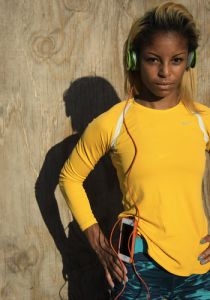 Sirena is a professional Track & Field Elite Athlete, Blogger, App Developer (more on that later), Mentor, and Olympic Hopeful. Sirena Alise Williams (that’s Sirena with an “i” and not an “e”, which would be the tennis player), a professional 100m hurdler currently touring on the USA and European professional track and field circuits, as the first ‘Face of SlimClip’. Sirena, who has been confused with and forever linked with the “other Serena”, with a slightly different spelling and the exact same sir name, has decided to break off from the identity confusion by re-branding herself with her middle name (Alise) substituted for her sir name. “Sirena Alise is an inspiration to the tenacious in spirit and a testament to the ethos of hard work.” states Keith Hall, Co-Founder of theWTFactory. She is steadily improving her performances making her way toward the Track and Field elite level hoping to qualify for the 2016 Olympics in Rio, Brazil. Follow her as she tells her story with the help of SlimClip Case. ← Who is Sirena Alise?